New University of Minnesota research shows reallocating croplands away from fuels and animal feed could boost food available for people by 70 percent without clearing more land. The world’s croplands could feed 4 billion more people than they do now just by shifting from producing animal feed and biofuels to producing exclusively food for human consumption, according to new research from the Institute on the Environment at the University of Minnesota. Demand for crops is expected to double by 2050 as population grows and increasing affluence boosts meat consumption. Meat takes a particularly big toll on food security because it takes up to 30 crop calories to produce a single calorie of meat. In addition, crops are increasingly being used for biofuels rather than food production. 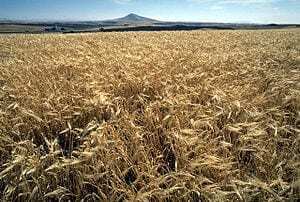 This study sought to quantify the benefit to food security that would accrue if some or all of the lands used to produce animal feed and fuel were reallocated to directly produce food for people. Only 12 percent of crop calories used for animal feed end up as calories consumed by humans. Only 55 percent of crop calories worldwide directly nourish people. U.S. agriculture alone could feed an additional 1 billion people by shifting crop calories to direct human consumption. When calculated on the basis of protein rather than calories, results were similar. For instance, of all plant protein produced, 49 percent ends up in human diets. April 12, 2019 - Into the woods: should UK cropland be replaced by forest? New StatesmanForests may be the realm of wolves and fairy tales, but they have also always been a place where animals grazed in the undergrowth. April 15, 2019 - Good News About Cover Crops from the Census of Agriculture Natural Resources Defense CouncilLast week USDA released the results of the 2017 Census of Agriculture. The previous 2012 Census was the first one to include a question about cover crops.